High Country for a top seller. The next generation Chevrolet Silverado will not take a big styling redirection. Instead, the 2014 model will feature updated technologies and engines in a bid to chip away at the Ford Motor Company’s significant lead in all things large pickup trucks. However, the updated model line will now be capped by a signature “High Country” crew cab edition, a premium model that will complement existing LTZ and Z71 editions. The Silverado High Country may very well position Chevrolet better in its gradual quest to take on and take down the Ford F-150, the segment sales leader since the late 1970s. The 2014 Chevrolet Silverado High Country will instantly be recognized by its unique chrome grill with horizontal chrome bars. Flanking the grille are a pair of halogen projector beam headlamps. This model will also feature special body-color treatments on the front and rear bumpers. Every Silverado High Country will be outfitted with 20-inch chrome wheels set within all-season tires. Other embellishments include chrome touches on the door handles, side mirrors and on the body side moldings. But it may be the truck’s interior that will best help this model battle against the top vehicles in the Ford F-150 portfolio including the King Ranch, Platinum and all-new Limited editions. The High Country cabin will be outfitted with a saddle brown interior, exclusive to this model. Chevrolet makes use of authentic materials and gives this five-passenger, four-door truck heated and cooled perforated front bucket seats. 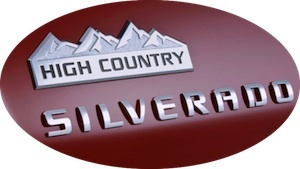 High Country logos can be found on the headrests and each model is equipped with a Bose audio sound system, Chevrolet MyLink connectivity with an 8-inch touch screen as well as front and rear park assist. Noted Maria Rohrer, Chevrolet Silverado marketing director, “High Country will be the top model in the Silverado lineup, with a higher level of premium features and materials with a rich, Western-themed appearance.” Rohrer explained that High Country retains the reputation this truck line has earned, indeed what Chevrolet trucks have delivered for the past 95 years. The first Chevrolet pickup truck was introduced in 1918. An updated version of Chevrolet’s small block 5.3-liter V-8 engine will power the Silverado High Country. This EcoTec3 engine makes 355 horsepower and should deliver 23 mpg on the highway for the 4×2 model. A 4×4 version will also be available. Active fuel management is also present, a technology features that shuts down half the cylinders at highway cruising speeds in a bid to extend fuel range. A six-speed automatic transmission is standard across the Silverado line. Optionally, customers choose a 6.2-liter V-8 engine and select popular amenities such as a sunroof, a rear-seat entertainment system and a navigation system. A High Country Premium Package serves up a driver alert package, adjustable pedals, a heated steering wheel, and an integrated trailer brake controller. 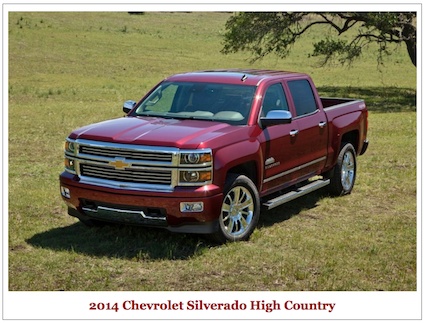 In 2012, Chevrolet sold 418,312 Silverado pickup trucks and another 23,995 Avalanche models. Those numbers, however, were far behind the 645,316 F-Series units sold by Ford reports Motor Trend magazine. The Chevrolet Avalanche has since been discontinued. Other segment competitors include the Ram 1500, Toyota’s Tundra and the Nissan Titan. The GMC Sierra is a twin to the Chevrolet Silverado. Silverado High Country photo courtesy of the General Motors Company.